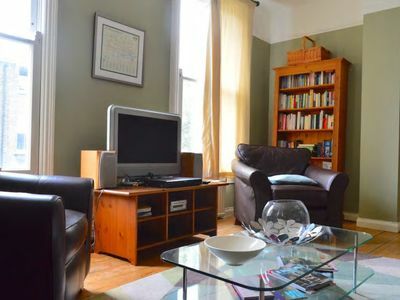 Welcome to my lovely 2-bedroom flat in lively Kentish Town! It is located on a quiet street, but at the same time just minutes away from all the cosy bars and restaurants of Camden. The home is spread over several floors and there's even a small roof terrace and a private garden for your enjoyment. The airy living room is perfect for relaxing after a long day exploring London. There is a comfy sofa as well as a TV with a DVD player (sadly no terrestrial channels) to keep you entertained. You will also have access to a lovely roof terrace - perfect for having that morning cup of coffee. In the bedrooms you will find very comfortable king size beds to ensure you get a good night’s sleep. My cleaners place fresh, hotel quality linen and towels on your bed prior to arrival.